Google! Well, my growing up years gave me the interest and the background. Involved in music already from age 4 and active on worship teams at an early age, I became a missionary kid at age 12 when my parents moved to the Dominican Republic to help plant a church. When I was in college, the church leadership asked me to transcribe some of the songs of the church, so the next generation could learn to play them—the older musicians played everything from memory and their skills weren’t being passed on, so I charted everything out and taught the younger generation to read chords. Somewhat unusually, our Dominican church employed typical Latin American rhythms, exposing me to indigenous Dominican as well as some broader Latin rhythms. Some years later, in 2003, I started Proskuneo, with a focus on multi-cultural worship in 2003, and began looking for connections with others who shared my passion. 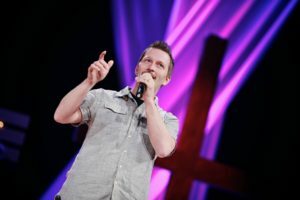 In 2005, Google searches on words like music, missions, arts, cross-cultural, and multicultural worship kept bringing up hits with Paul Neeley’s name. One time when I was going to be traveling through Texas, I asked if we could meet. Paul graciously drove to the Dallas airport and sat at the baggage claim with me for an hour, providing me with enough connections to keep me busy for years. He also invited me to GCoMM 2006, and I was hooked. I’d like to see greater numbers of younger people realize the beauty of their own music and also connect the dots between their passion for crossing cultures and their passion for music. Since the future of the church is multi-ethnic, people need to learn to value their own cultures and be comfortable with crossing cultures at the same time. I’d love to see the church on the front edge of creating some new styles that honor the cultures they come from but also include multicultural elements. What would it look like for an Emberá musician to partner with a tabla player from India and a geomungo player from Korea?